A Liebherr LTR 1220 telescopic crawler crane is operating at an altitude of almost 5,000m in the Peruvian Andes. 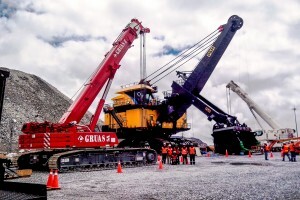 The 220t LTR 1220, which Liebherr claims is the first crane of this type in Latin America, has been working at the Antamina copper-zinc mine, Mining equipment specialist Joy Global Peru SAC has the crane on long term hire from crane owner Gruas Alquileres SA. The unit has been working in difficult conditions, including extreme temperature fluctuations. Its main work is unloading the components of two electrical mining excavators and assembling them, The mine is one of the ten largest in the world, with 24/7 operations and around 430,000 tonnes of material extracted every day.